Freeze drying is the perfect way to preserve varieties of apples that aren't available year round. 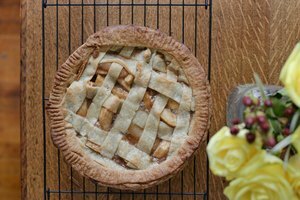 Apples that have been freeze dried are more versatile than many think--they can be used in a variety of recipes including sauces, chutneys, trail and party mixes, oatmeal, cereals, cookies, cakes and bread puddings. To freeze dry apples at home, you don't need any expensive equipment, just your freezer. Get a perforated tray, mesh tray, or baking rack from a discount, kitchen supply, or baking supply store. Baking racks are also known as cooling racks, and are easy to find as well as very inexpensive. Clear a space in your freezer large enough to hold your tray or baking rack. Wash the apples and set them on two layers of paper towels to thoroughly dry. Remove the core and stem from your apples, then cut each one in half vertically. Make paper-thin vertical slices from each apple half. 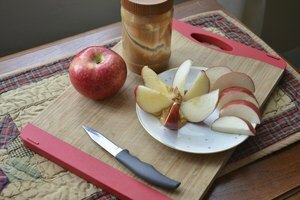 If your knife is not able to make paper thin slices, cut the apples into slices that are no more than one-quarter inch thick. Arrange the apple slices on your tray immediately, ensuring that they do not overlap. It is fine for their edges to touch. Place the apple slices in your freezer, uncovered. Let them freeze dry--this will take at least a week. 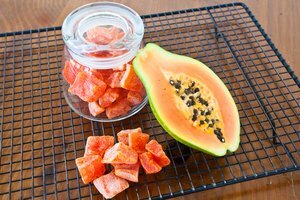 To check and see if the slices are frozen, take one out after a week and let it thaw. If it retains its color, it is ready, but if it turns a dark color, they need more time to freeze dry. Store your freeze dried apples in an airtight canister, plastic container or plastic bag. The thicker the apple slices are, the longer it will take them to completely freeze dry. You can reconstitute your dried apples by putting them in a bowl and pouring just enough boiling water over them to cover. Alternatively, add cold water to the bowl and microwave it for three to five minutes.